Background : Tissue Doppler Imaging (TDI) is a sensitive index of myocardial function. Its role in the fetus has not been extensively evaluated. Methods: Cross-sectional retrospective study conducted at 2 large perinatal centers (2003-2007). Fetuses with HLHS ( n = 13) were compared with normal fetuses ( n = 207) in 5 gestational age groups. TDI data included peak systolic (s'), peak early (e'), and late diastolic velocities (a'). Linear regression was used to compare TDI parameters in fetuses with HLHS to normal fetuses matched for gestational age. Results: Fetuses with HLHS had significantly reduced lateral tricuspid annular e' as compared to normal fetuses. Both normal fetuses and those with HLHS had linear increase in TDI velocities with advancing gestational age. Conclusions: TDI velocities are abnormal in fetuses with HLHS. TDI can be useful in serial follow-up of cardiac function in fetuses with HLHS. Tissue Doppler Imaging (TDI) is a well-established tool to evaluate both systolic and diastolic ventricular function. This technique has been validated in normal children and adults and in a wide variety of pathophysiological conditions. ,,,,,,,,, Pulsed-wave Doppler sampling at the base of the heart in the apical four-chamber orientation allows evaluation of myocardial motion in the longitudinal plane. Measurements of peak myocardial velocities in early (e') and late diastole (a') as well as systole (s') are sensitive indices of diastolic and systolic function, respectively. In addition, peak myocardial velocity during isovolumetric contraction can also be measured as a load-independent index of systolic ventricular function. Time intervals of isovolumetric contraction (ICT) and relaxation (IRT) can be obtained from TDI tracings as additional useful time indices of ventricular function. To compare myocardial tissue doppler velocities in fetuses with hypoplastic left heart syndrome (HLHS) to those of normal fetuses matched for gestational age. This retrospective study was performed at 2 large perinatal cardiology practice centers between 2003 and 2007. The study was approved by the Institutional Review Boards at both institutions. Fetal tissue Doppler data were obtained, including measurements of the early diastolic (e'), late diastolic (a') and systolic (s') velocity in cm/s. Twenty-five fetuses with HLHS were evaluated during this time period; however, adequate tissue Doppler tracings were obtained in only 13 of these. These 13 fetuses with HLHS constituted Group 2 ( n = 13). Fetuses of diabetic mothers were not included in either group because of the potential hypertrophic effect of maternal diabetes. Similarly, fetuses with other systemic abnormalities that might potentially affect ventricular function were excluded, such as fetuses with hydrops, twin-twin transfusion syndrome, diaphragmatic hernia, or large pulmonary cystic adenomatoid malformations. Imaging was performed using the Acuson Sequoia ultrasound system (Siemens Medical Solutions, Mountain View, CA, USA) at both imaging sites. Myocardial TDI velocities were acquired using instantaneous pulsed-wave Doppler at the base of the fetal heart in the 4-chamber view aligned as parallel as possible to the plane of longitudinal motion. If it was not possible to obtain a doppler tracing with less than a 20 degree angle of insonation, the value was not recorded. Tracings were obtained from the interventricular septum, lateral tricuspid annulus and lateral mitral annulus. Doppler sweep speed was increased to obtain good spatial and temporal resolution of tracings. Measurements were made directly from the Acuson Sequoia (Siemens Medical Solutions, Mountain View, CA, USA) or off-line using the Xcelera Imaging Station software (Philips Medical Systems, Andover, MA, USA). Interobserver variability was measured by comparing TDI measurements between 2 observers at each site from 10 random studies. The Student's t test was used to analyze the differences between each group. A P value of <0.05 was considered significant. Linear regression models using analysis of covariance (ANCOVA) comparing groups adjusted for gestational age as a continuous covariate were generated. 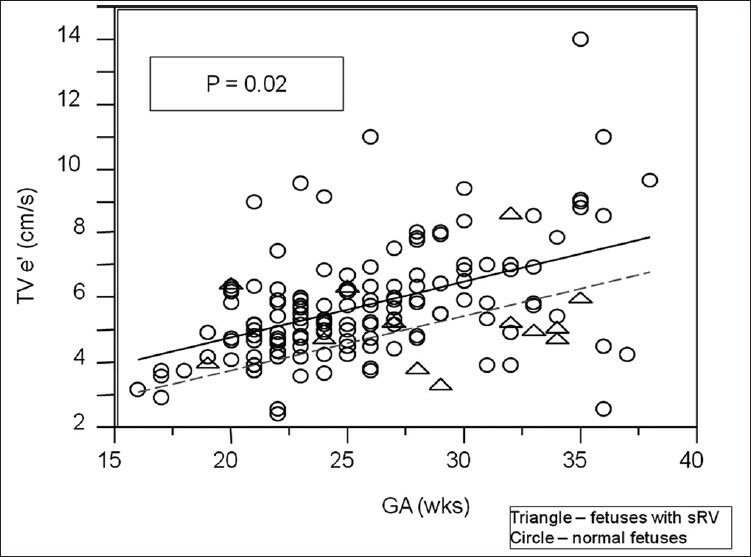 Two hundred and seven normal fetuses were analyzed in this study between 2003 and 2007 in the groups as described above [Table 1]. [Figure 1] demonstrates a typical fetal tissue doppler tracing. 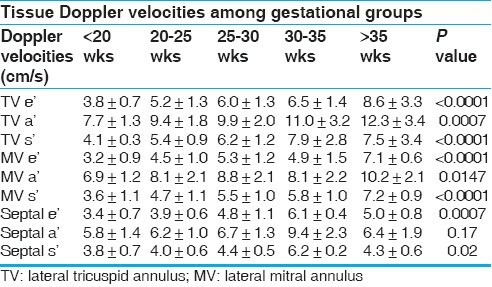 A significant linear increase in all tissue doppler velocities was noted with advancing gestational age. Interpretable TDI tracings could be obtained in over 60% of fetuses for any given parameter. The most reliable tracings were those from the lateral tricuspid annulus, while those from the interventricular septum were most difficult to acquire. As has been previously published. ,,,,,, , there is a linear increase in TDI velocities with gestational age. This trend and derived regression equations are shown in [Figure 2], [Figure 3] and [Figure 4]. During this same time period, 25 fetuses with HLHS were evaluated. Only fetuses that had adequate tissue Doppler tracings including reliable early diastolic (e'), late diastolic (a') and systolic (s') waves were included in the analysis. Out of the 25 fetuses with HLHS, adequate complete tissue Doppler tracings were obtained on 13 of them. Since gestational age has a profound influence on the fetal TDI velocities, we used gestational age as a continuous co-variable to determine the differences between fetuses with HLHS and normal fetal controls of comparable gestational age. Linear regression derived differences in mean TDI velocities were noted. [Figure 5] shows a comparison of TDI velocities in fetuses with HLHS as compared to normal controls. The lateral tricuspid annular e' was significantly lower than normal in fetuses with HLHS as compared to normal controls. This difference was noted at all gestation ages. There were no significant differences in a' and s' between fetuses with HLHS and controls. There was very good interobserver variability with mean variability of approximately 5% (range 0-16%). There was no evidence of systematic bias. TDI is a sensitive and specific index of ventricular function and has been well validated in a wide variety of cardiovascular disorders in adults and children. There is a paucity of data, however, on TDI velocities in the fetus. ,,,,,, Since the first step in utilizing TDI data is to establish normative data over a wide range of gestational ages, we included a large number of normal fetuses in the study (n = 207). Analysis of the normal controls demonstrates progressive increase in longitudinal TDI velocities from early to late gestation. The reasons for this are thought to be multifactorial and improvement in myocardial contractility and compliance with advancing gestation have been noted by several authors. , However, there is also some suggestion that the increase in velocity may merely be a reflection of increased translation - the myocardium moves through a greater distance as the heart grows without a change in the timing intervals thus leading to an increase in absolute velocity. After birth TDI velocities continue to increase steadily from the neonate to adolescence due to significant changes in cardiac size and ventricular mass. Our fetal data serve as a similar reference standard for comparison in fetuses with congenital heart disease. Nii et al. have published normative fetal tissue Doppler velocities in 114 fetuses ranging from 14 to 42 weeks gestation. Their TDI velocities were acquired utilizing color myocardial Doppler which represent mean TDI velocities, whereas our current study measured instantaneous pulsed-wave tissue Doppler. Previously, it has been shown that pulsed-wave tissue Doppler velocities are 20% higher than those derived by color myocardial Doppler. This methodology may explain why myocardial velocities in our normal values are generally higher than those reported by Nii's group. Nii's study as well as prior studies by Chan et al. showed a progressive increase in TDI velocities with advancing gestation, which was also demonstrated by our present large study. Data on the clinical utility of TDI in the fetuses is currently lacking. At present, the diagnosis of fetal cardiovascular dysfunction is based largely on qualitative changes in cardiac size and function that may not be present until very late, including cardiomegaly, hydrops, or abnormal Doppler flows in the umbilical artery, vein, ductus venosus, and middle cerebral artery. It is hoped that TDI will provide a more quantitative tool to add to our "cardiovascular profile score." Further studies will be necessary to determine if TDI can be of prognostic importance. For instance is it possible to predict which fetuses with aortic stenosis will progress to HLHS by serially analyzing TDI velocities? The relatively low numbers of such fetuses at single institutions mandates multicenter collaboration in such a research endeavor. Just as important, TDI may play a role in the evaluation of acute and long-term efficiency of therapeutic interventions. The last five years have seen significant progress in the arena of fetal intervention for critical aortic valve stenosis, critical pulmonary valve stenosis  and relief of pulmonary venous obstruction in fetuses with HLHS with intact or restrictive atrial septum. While "success" of these procedures is generally measured by both clinical survival and eventual biventricular repair, it would be important to have quantitative markers of improvement in cardiac performance that can be measured more reliably. TDI in combination with other new modalities of assessing ventricular function such as strain and strain rate imaging may add incremental value and clinical insights in these issues. This study represents the one of the first studies of tissue Doppler velocities in fetuses with HLHS. Interesting observations from this study need to be validated by further larger studies in the fetal population. 1. Nagueh SF, Middleton KJ, Kopelen HA, Zoghbi WA, Quinones MA. Doppler tissue imaging: A noninvasive technique for evaluation of left ventricular relaxation and estimation of filling pressures. J Am Col Cardiol 1997;30:1527-33. 2. Dokainish H, Zoghbi WA, Lakkis NM, Al-Bakshy F, Dhir M, Quinones MA, et al. Optimal noninvasive assessment of left ventricular filling pressures: A comparison of tissue Doppler echocardiography and B-type natriuretic peptide in patients with pulmonary artery catheters. Circulation 2004;109:2432-9. 3. Eidem BW, McMahon CJ, Cohen RR, Wu J, Finkelshteyn I, Kovalchin JP, et al. Impact of cardiac growth on Doppler tissue imaging velocities: A study in healthy children. J Am Soc Echocardiogr 2004;17:212-21. 4. Hashimoto I, Bhat AH, Li X, Jones M, Davies CH, Swanson JC, et al. Tissue Doppler-derived myocardial acceleration for evaluation of left ventricular diastolic function. J Am Coll Cardiol 2004;44:1459-66. 5. McMahon CJ, Nagueh SF, Pignatelli RH, Denfield SW, Dreyer WJ, Price JF, et al. Characterization of left ventricular diastolic function by tissue Doppler imaging and clinical status in children with hypertrophic cardiomyopathy. Circulation 2004;109:1756-62. 6. Nagueh SF, McFalls J, Meyer D, Hill R, Zoghbi WA, Tam JW, et al. Tissue Doppler imaging predicts the development of hypertrophic cardiomyopathy in subjects with subclinical disease. Circulation 2003;108:395-8. 7. Ommen SR, Nishimura RA, Appleton CP, Miller FA, Oh JK, Redfield MM, et al. Clinical utility of Doppler echocardiography and tissue Doppler imaging in the estimation of left ventricular filling pressures: A comparative simultaneous Doppler-catheterization study. Circulation 2000;102:1788-94. 8. Vogel M, Cheung MM, Li J, Kristiansen SB, Schmidt MR, White PA, et al. Noninvasive assessment of left ventricular force-frequency relationships using tissue Doppler-derived isovolumic acceleration: Validation in an animal model. Circulation 2003;107:1647-52. 9. Vogel M, Derrick G, White PA, Cullen S, Aichner H, Deanfield J, et al. Systemic ventricular function in patients with transposition of the great arteries after atrial repair: A tissue Doppler and conductance catheter study. J Am Coll Cardiol 2004;43:100-6. 10. Wang M, Yip GW, Wang AY, Zhang Y, Ho PY, Tse MK, et al. Peak early diastolic mitral annulus velocity by tissue Doppler imaging adds independent and incremental prognostic value. J Am Coll Cardiol 2003;41:820-6. 11. Yu CM, Chau E, Sanderson JE, Fan K, Tang MO, Fung WH, et al. Tissue Doppler echocardiographic evidence of reverse remodeling and improved synchronicity by simultaneously delaying regional contraction after biventricular pacing therapy in heart failure. Circulation 2002;105:438-45. 12. Tworetzky W, Wilkins-Haug L, Jennings RW, van der Velde ME, Marshall AC, Marx GR, et al. Balloon dilation of severe aortic stenosis in the fetus: Potential for prevention of hypoplastic left heart syndrome: Candidate selection, technique, and results of successful intervention. Circulation 2004;110:2125-31. 13. Aoki M, Harada K, Ogawa M, Tanaka T. Quantitative assessment of right ventricular function using doppler tissue imaging in fetuses with and without heart failure. J Am Soc Echocardiogr 2004;17:28-35. 14. Chan LY, Fok WY, Wong JT, Yu CM, Leung TN, Lau TK. 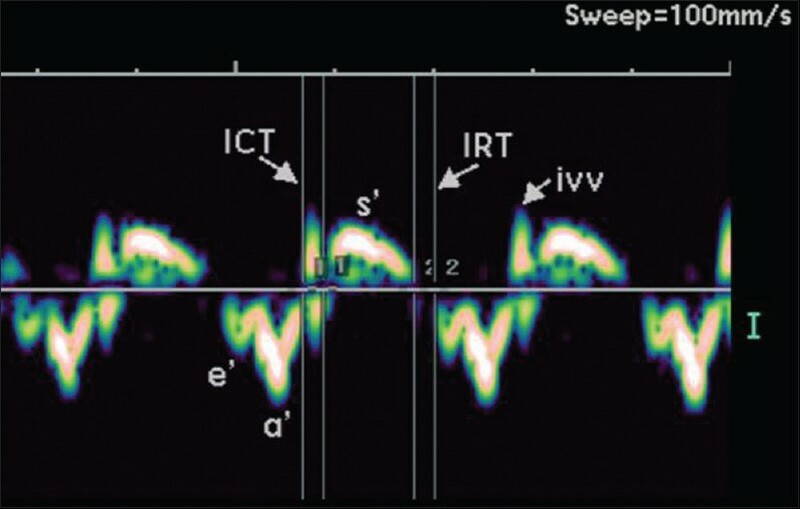 Reference charts of gestation-specific tissue Doppler imaging indices of systolic and diastolic functions in the normal fetal heart. Am Heart J 2005;150:750-5. 15. Gardiner HM, Pasquini L, Wolfenden J, Barlow A, Li W, Kulinskaya E, et al. Myocardial tissue Doppler and long axis function in the fetal heart. Int J Cardiol 2006;113:39-47. 16. Harada K, Tsuda A, Orino T, Tanaka T, Takada G. Tissue Doppler imaging in the normal fetus. Int J Cardiol 1999;71:227-34. 17. Paladini D, Lamberti A, Teodoro A, Arienzo M, Tartaglione A, Martinelli P. Tissue Doppler imaging of the fetal heart. Ultrasound Obstet Gynecol 2000;16:530-5. 18. Reed KL, Sahn DJ, Scagnelli S, Anderson CF, Shenker L. Doppler echocardiographic studies of diastolic function in the human fetal heart: Changes during gestation. J Am Coll Cardiol 1986;8:391-5. 19. Tutschek B, Zimmermann T, Buck T, Bender HG. Fetal tissue Doppler echocardiography: Detection rates of cardiac structures and quantitative assessment of the fetal heart. Ultrasound Obstet Gynecol 2003;21:26-32. 20. Nii M, Roman KS, Kingdom J, Redington AN, Jaeggi ET. Assessment of the evolution of normal fetal diastolic function during mid and late gestation by spectral Doppler tissue echocardiography. J Am Soc Echocardiogr 2006;19:1431-7. 21. Pettersen E, Helle-Valle T, Edvardsen T, Lindberg H, Smith HJ, Smevik B, et al. Contraction pattern of the systemic right ventricle shift from longitudinal to circumferential shortening and absent global ventricular torsion. J Am Coll Cardiol 2007;49:2450-6. 22. Hofstaetter C, Hansmann M, Eik-Nes SH, Huhta JC, Luther SL. A cardiovascular profile score in the surveillance of fetal hydrops. J Matern Fetal Neonatal Med 2006;19:407-13. 23. Galindo A, Gutierrez-Larraya F, Velasco JM, de la Fuente P. Pulmonary balloon valvuloplasty in a fetus with critical pulmonary stenosis/atresia with intact ventricular septum and heart failure. Fetal Diagn Ther 2006;21:100-4. 1 Myocardial Motion and Deformation: What Does It Tell Us and How Does It Relate to Function? 3 Myocardial motion and deformation: What does it tell us and how does it relate to function? Bijnens, B., Cikes, M., Butakoff, C., Sitges, M., Crispi, F.
Miller, T.A., Puchalski, M.D., Weng, C., Menon, S.C.